What are your weaknesses examples ? 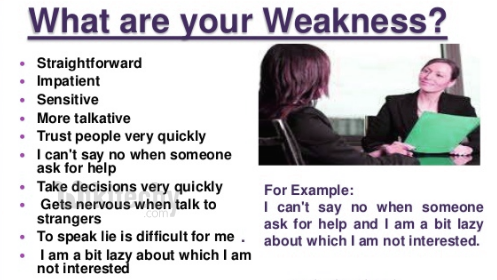 What is your greatest weakness ? In my last position, I wasn't able to develop my public-speaking skills. I'd really like to be able to work in a place which will help me get better at giving presentations and talking in front of others. Sometimes I am little lazy, believing every one which is not true in all case. I am unable to say No directly if somebody asks me for help. Also, I believe I'm not at all an extremely talkative person. Sometimes it is my strength too. But I am improving to overcome it.